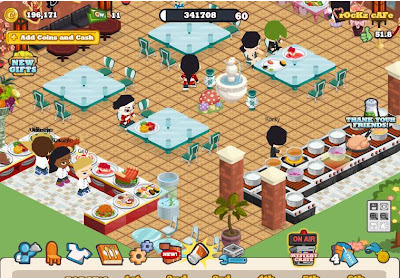 Home Bright Orange Cafe Cafe Cafe World Chef Rocky Chowking Facebook Facebook Addiction Facebook Application Facebook Games interior design online game orange restaurant Resto Rockz Cafe A Brighter Than Orange New Rockz Cafe! 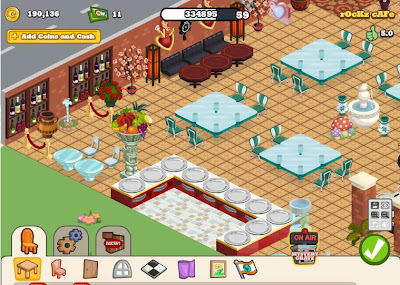 After being a 'Red Cafe' inspired by the Chinese New Year and Valentines Day then became a Casino inspired 'Elegant Cafe', Rockz Cafe, my Facebook's Cafe World now dressed again into a new look! Brighter than orange, let us all welcome the brand new Rockz Cafe now called as the 'Bright Orange Cafe'! 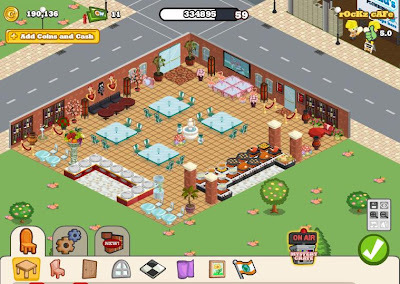 Inspired by orange, the latest interior design of the Rockz Cafe is based on the modern restaurants and classy food chains where orange is the theme. But why did I decide to redress the appearance of my cafe into orange? Are there any personal attachments? Yeah, I know you all know that the color orange plays a great role in my lovelife way back in college. For one and a half year, orange speaks the color of my heart. I was very much inloved with orange before. It was started with the cheering where all the cheerers wear orange up to the time that I really fight for my love who always wear orange! Haha! But all those things now were part of my rich memories. The color of orange is still my favorite. It is the color which symbolize brightness and smartness! It reflects intelligence! 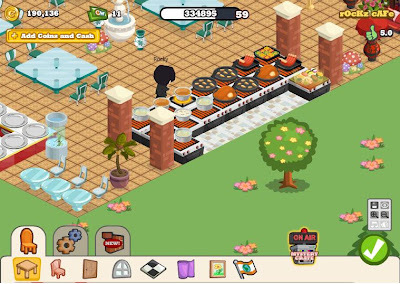 With those backgrounds about orange, it comes to my idea to use orange as my current new theme for my Rockz Cafe restaurant. And this new innovation become successful! 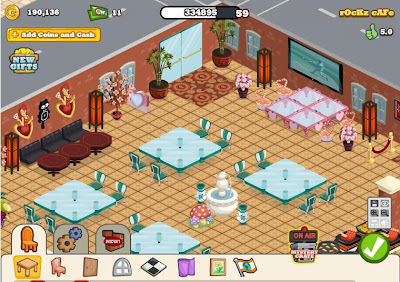 As you can see, the latest design of my cafe looks more brilliant, attractive to the eyes, and always feels cool, relaxing, and clean! It is much better than my previous elegant cafe design! People Enjoy Eating in a Fresh New Look! My Waiters Stay on the Counter, Chef Rocky Always in the Kitchen! The place is now dominated with orange. The floor, the walls were all covered with the brightness of orange! The floor now is covered with the bright orange tiles. It smooth to see. It makes the appearance of my cafe to always look clean and fresh! At the same time, its walls were now painted with a cute hue of orange. The walls and the floor compliment each other! The four pillars surrounding my stoves matched them! 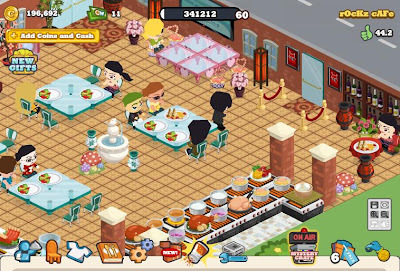 Some of the furniture in this cafe were maintained like the black sofas, the red solo sofa, the wall decorations, the windows, the jars, and of course the LCD flat screen TV mounted on the wall. Still the glass tables and chairs were maintained. The only difference is that the former white chairs were now changed to cozy green chairs that matched exactly with the glass tables! Additional round maroon tables were added for the black sofas. A red table then was also added for the only red sofa. Now my sofas cater the customers. They can now dine-in on them! 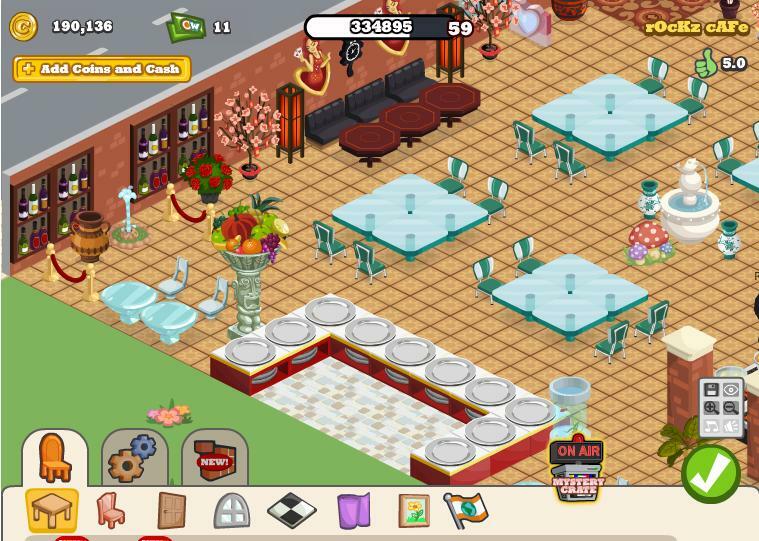 And of course the layout of my resto was also changed! Since I already expanded my cafe before it was turned to orange, why not make a new design layout? My stoves and my counters were now separated into two different areas. And their floors were covered with white marble tiles. Really nice! I very much love this current design of my Rockz Cafe. It's better than the previous elegant cafe design! I feel relax whenever I see it! So fresh and nice, it brightens my mind! Cool!